Where does one get their cooking inspiration? A lot of people will refer back to their childhood, and learning to cook with family or the food that comes from their parents or grandparents culture. 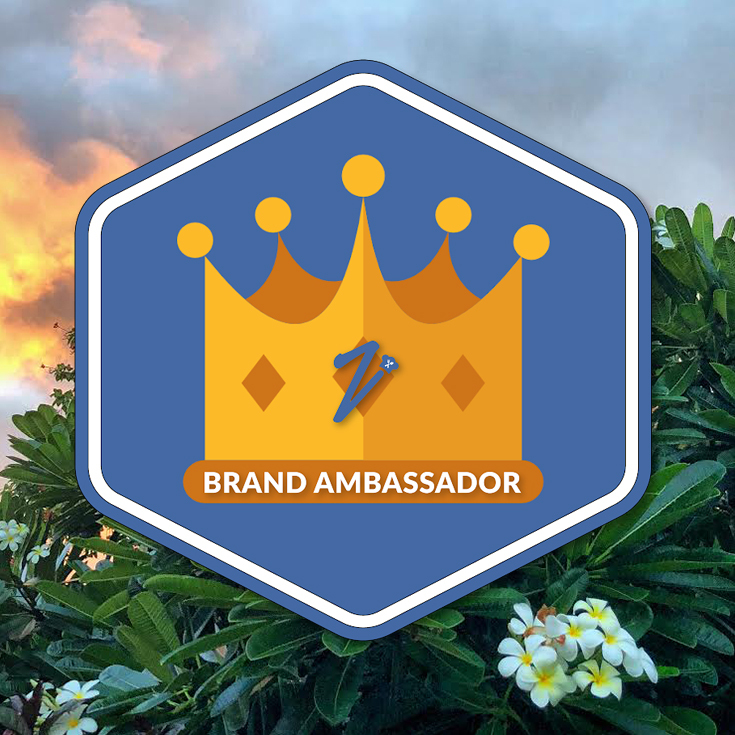 A lot of people will refer back to where they grew up and turn it into buzz words: their southern roots, their island flair, their spicy attitude. For me, I didn’t grow up in a house where people loved to cook. Since my family tree is full of mutts (a term used lovingly) from places like Lithuania, Russia and other random European countries, there wasn’t a cultural cuisine that we practiced. Dinner was just dinner, and if there was something special about it, it went over my head because I was probably refusing to eat it as I heated myself up some chicken nuggets. My motto is “I cook what I like.” (My blog e-mail is actually icookwhatilike@gmail.com, if you wanted to get in touch.) I started out in cooking by learning to make the very limited amount of dishes I enjoyed, and branched out from there. That’s pretty much my approach now to individual recipes: start with something I know, and figure out how to make it my own. Since I don’t have my own built-in family food culture, my inspiration comes from restaurants, books, people and of course, the wonderful places I’ve lived in and traveled to. 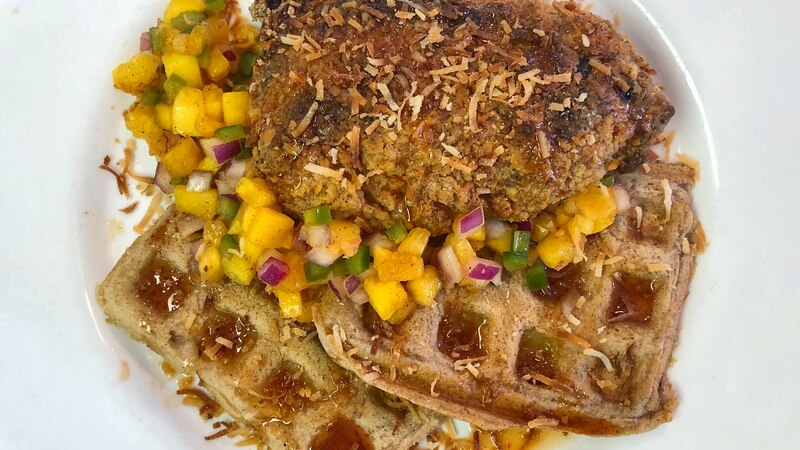 Today’s recipe was actually inspired by a little breakfast spot down the street from me that makes “Hawaiian waffles”. Diced pineapple, toasted coconut & coconut syrup. YUM. As I was eating them, my mind wandered from the beaches of Oahu to Savannah, GA, where I lived for almost 5 years. My absolute favorite brunch dish is chicken and waffles, so I decided I wanted to see what that would look like on a tropical vacation. Thus, a recipe was born. The Salsa – this is the easiest place to start, because you can make it a day or two in advance. You’ll probably have leftovers, and you’ll be happy about it. 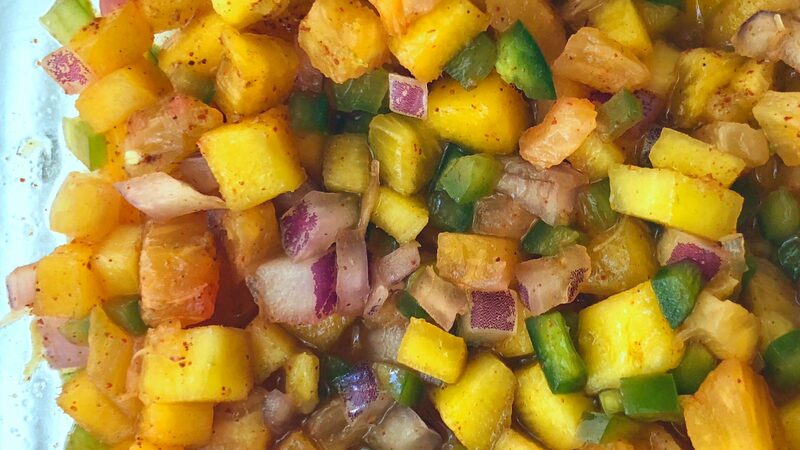 Combine the pineapple, mango, jalapeño (1 or 2 depending on how spicy you want it) and red onion in a bowl. Add the zest and juice of the lime, chili powder & a pinch of sea salt. Cover tightly & refrigerate, up to a week. The Brine – it’s super important to brine fried chicken so it doesn’t dry out. I like adding pineapple juice to mine because the acid makes the meat even more tender & flavorful. Mix together pineapple juice, water, salt & chili powder in a large glass bowl or tray. Submerge the chicken fully. (Add a little extra water if you need to, depending on your vessel.) Cover & refrigerate for 2 hours to overnight. The Breading – this step can be messy. I like to use ziploc or paper bags to toss the chicken around in. If I’m doing a big batch, those disposal aluminum trays from the grocery store work great. Mix together 1 cup of flour with the garlic powder, chili powder, salt & pepper. Toss the chicken until evenly coated. Mix together the remaining 1/2 of flour with the panko bread crumbs. Dredge the chicken in the beaten eggs & immediately toss in the panko mixture until evenly coated. Fry as you please- I tried out my new air-fryer for this recipe, so if you have one, follow your models instructions for cooking fried chicken. You can also fry in oil, at 350-375 degrees for about 15 minutes, until the internal temperature is 160. If you prefer to do “oven-fried”, I would suggest lightly spraying the breaded chicken with canola or vegetable oil spray to ensure a crispy crust. 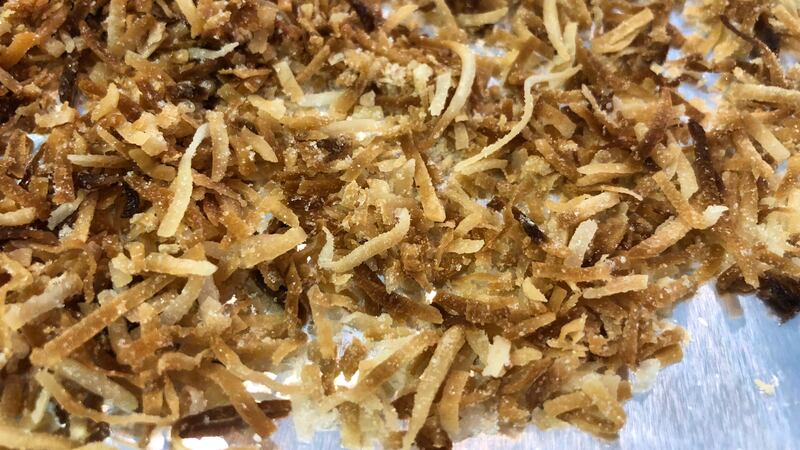 The Toasted Coconut – I tried to incorporate coconut into the breading, but it would burn, so it became it’s own, easy step. Cook the coconut on a lined baking sheet in the toaster oven or oven at 350 degrees. Stir & toss the coconut every 45 seconds to a minute until golden brown. The Waffles – don’t worry, with everything else going on, I don’t expect anyone to make these from scratch. You can also make these as pancakes if you don’t have a waffle iron. Place 8 pineapple slices onto paper towels & pat dry. Reserve 1/4 cup pineapple juice. Mix the batter to the boxes instructions for 8 waffles, subtracting a 1/4 cup of the water required. Substitute it with the 1/4 cup of pineapple juice. Stir in the cinnamon & vanilla until smooth. Pour the batter onto a greased waffle iron, preheated to about 400 degrees, careful to not overfill. 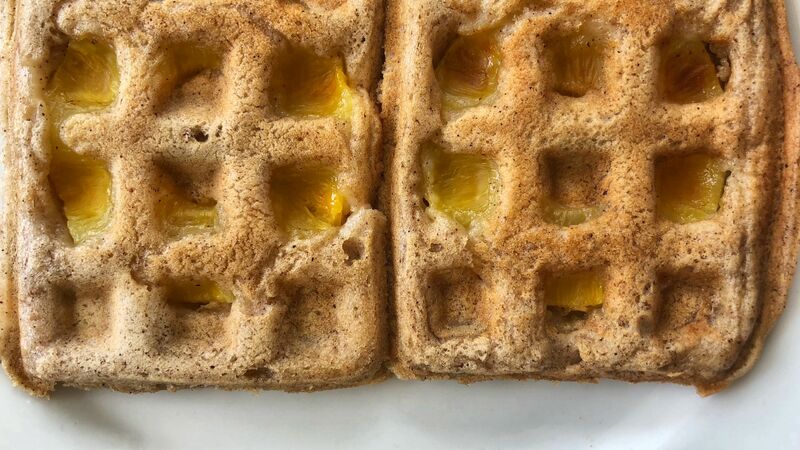 Drop a pineapple slice into the center of each waffle, close the iron & cook for about 5 minutes, until golden brown. 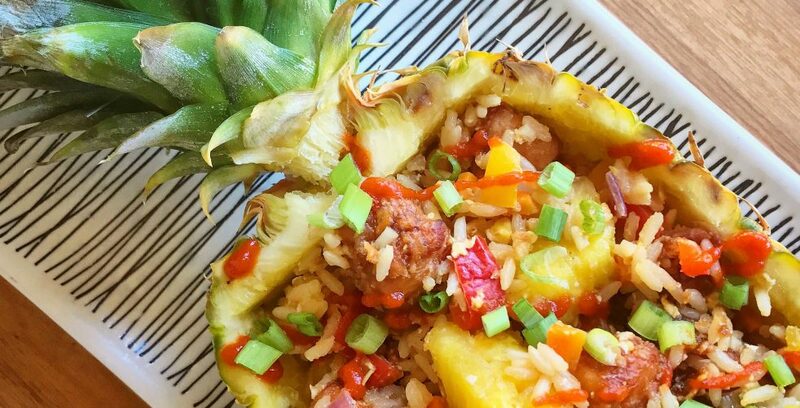 Sometimes the extra moisture in the pineapple will require an extra minute or two of cooking. The Sauce – there’s more? We’ve come too far for boring old maple syrup. Mix together the maple syrup, honey & sriracha until blended. Drizzle & serve! To Assemble – this makes four servings, so put two waffles on each plate. Place the fried chicken alongside the waffles and drizzle with the spicy syrup. Top with the tropical salsa & the toasted coconut. ENJOY. Savory, spicy, sweet, fried, fresh, fluffy, crunchy… hmm, sounds like the seven dwarves in my foodie remake of Snow White. 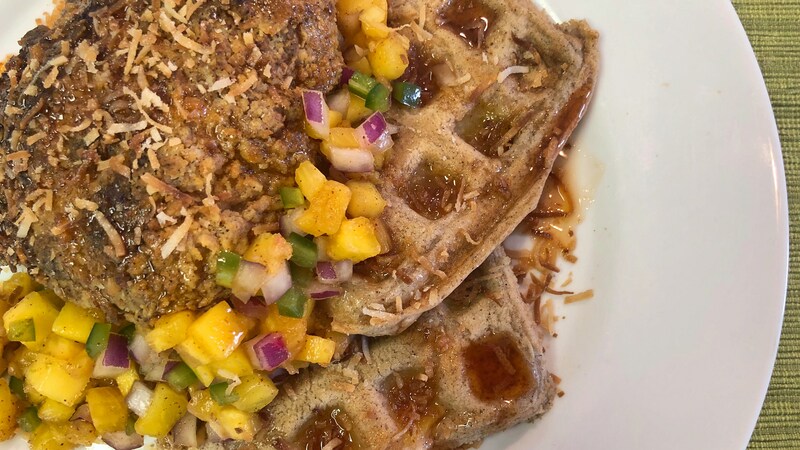 If I am at a new spot for brunch and I see chicken and waffles on the menu, I am all over it. Number one, it’s a good way to judge a restaurant by getting something from the breakfast and the lunch menu. Number two, it’s dang delicious. I love the contrast of sweet and spicy in this version, so this is basically heaven to me on a plate. 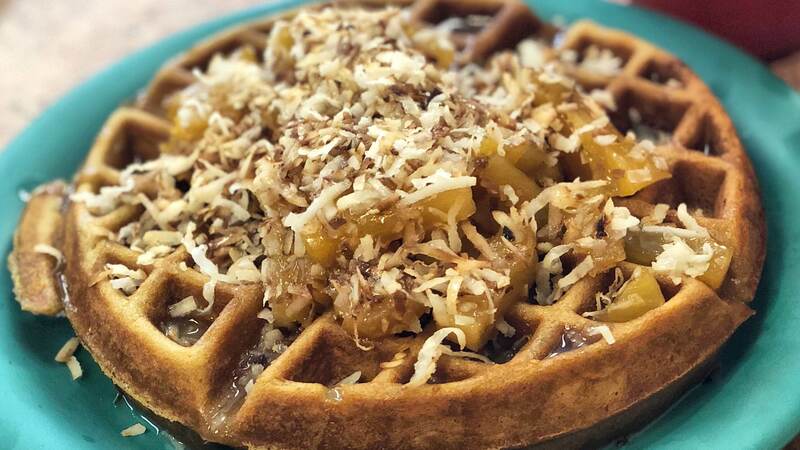 The salsa, the toasted coconut and the pineapple waffle are all tropical flavors, but they are also all pretty sweet. The spice infused throughout, particularly in the sauce, perfectly balances everything. This recipe is a smorgasbord of flavors and textures. And about that salsa. I have used different variations of it in recipes like my crab cake sandwiches and all the time on Taco Tuesdays, and it’s not going anywhere anytime soon. I love the color and freshness it brings to a dish, especially one like chicken and waffles, that would otherwise be be very monochromatic. So where do you get your inspiration from? Maybe you should make this recipe and see if it gets your creative juices going. Although, it’ll probably just get you ready for a nap, especially if it’s paired with a couple mimosas. Time to get back to the kitchen and dream up my next recipe! Previous Post What Are You Drinking?